ARLINGTON, Texas (AP) — Robinson Chirinos woke up in his own bed and took his son to school, just the way he did during his first six seasons in the big leagues with the Texas Rangers. 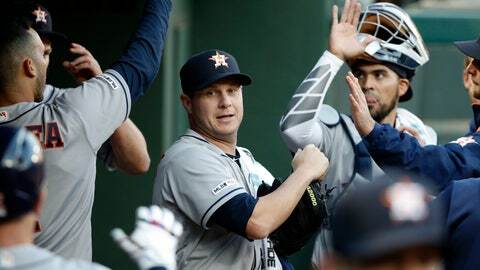 Houston’s new catcher finished a special day with two key plays that helped the Astros beat his former team for the ninth straight time in his old home ballpark. Houston’s George Springer connected for his 25th career leadoff homer against Drew Smyly, who was making his first major league start since the end of the 2016 season. Peacock (1-0) pitched without a baserunner through six innings, allowing only Ronald Guzman’s first homer leading off the third while striking out five in 6 2/3 innings. Rougned Odor reached on an infield single to start the seventh, but was thrown out trying to steal by Chirinos. Chirinos put the Astros ahead 2-1 in the sixth. The catcher’s looping liner over third baseman Asdrubal Cabrera scored Carlos Correa, who had his first three hits in his second game after missing the first three with neck stiffness. Springer’s 412-foot drive to left made it two straight years of going deep in his first at-bat in Arlington. The 2017 World Series MVP did it on opening day last year against Cole Hamels. Springer had two more against the Rangers last season. All four were against lefties. Smyly threw 73 pitches in three innings in the left-hander’s Texas debut, allowing four hits and one run with two strikeouts and two walks. He underwent Tommy John surgery in 2017 while with Seattle and was later signed by the Cubs. He never pitched for either team, and Chicago traded him to Texas in the offseason. Chirinos will get almost a full week of rare dad duty now that the family’s house in the Dallas area is his offseason home. He had breakfast with his 11-year-old son before taking him to school. That was the 34-year-old’s routine during his time with the Rangers. Adrian Sampson (0-1), called up from Triple-A Nashville earlier in the day to help a bullpen that was battered in a season-opening series win over the Cubs, allowed four hits and a run over the final six innings for the Rangers. He struck out three and walked two. “It’s just unfortunate that he ends up getting a loss for that because that was a win for him in so many ways,” Woodward said. Astros: RHP Justin Verlander is scheduled for his second start after striking out nine in seven innings in Houston’s 5-1 win over Tampa Bay on opening day. Rangers: RHP Shelby Miller, a Texas native, is set to become the fourth straight starter to make his Rangers debut, following Edinson Volquez (second Texas stint), Lance Lynn and Smyly. Miller appeared in five games for Arizona last year coming off Tommy John surgery in 2017.